Extruding plastic gun is a new type of hot air welder which is imported foreign advanced technology, well-developed. The major components (hot air gun and drive motor) are made of imported brand-name accessories, stable performance, long service life; They are two independent systems, one is for preheating raw material, another is for welding rod extrusion. 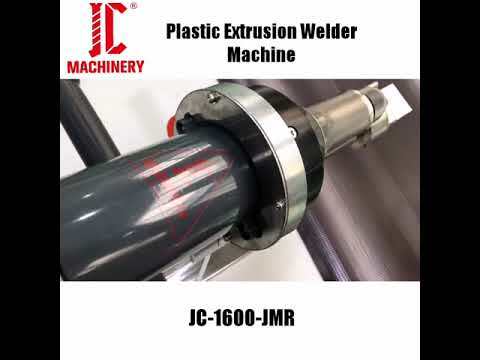 Reasonable structure, convenient operation, continuous welding, high working efficiency, powerful extrusion, to make the weld strength is greatly improved. It is the ideal product for a variety of thermoplastic welding processing. This product is with two major components, preheating raw material’s hot air part and welding rod’s extrusion part. Hot air part with adjustable temperature controller to heat automatically, and extrusion part with independent thermostatic heating control system to send hot air independently, It is easy to adjust extrusion speed and use screw extruding for powerful extrusion pressure. Using power supply uniformly to weld plastic sheets, tube and other thermoplastic products, especially for both ends of large diameter hollow wall pipe, producing pipe and repairing pipe and so on. Available welding materials: thermoplastic HDPE, PP, PVDF, especially PE .Do not apply in a conductive plastic (PE-EL), or cause the machine to produce a conductive short-circuit. 3) The thicker plastic membranes, geomembrane splicing, patching and so on. Temperature can be freely adjusted at 0-400C; high welding quality. Driving motor shuts off automatically if it cannot meet the correct operating temperature.